Wholesaling houses is made simple when you have LeadPropeller wholesaling website. Find out how to quickly build your buyers list and move those wholesale deals faster than you ever thought possible. It’s no secret that having a website is essential for running any kind of business in this market, let alone a real estate investing business. Having a website for wholesaling houses makes your real estate investing business more credible. Think about when you visit someone’s website. What makes you think they’re credible? It’s their expertise in their field. If you go to another investors’ website and see that they’ve never done a successful deal, or that their website looks completely fake, would you actually do a deal with them? Probably not. Take a look at this example from a wholesaler in Colorado. WholesaleDealsinColorado.com has details of successful wholesale deals right there on the front page. 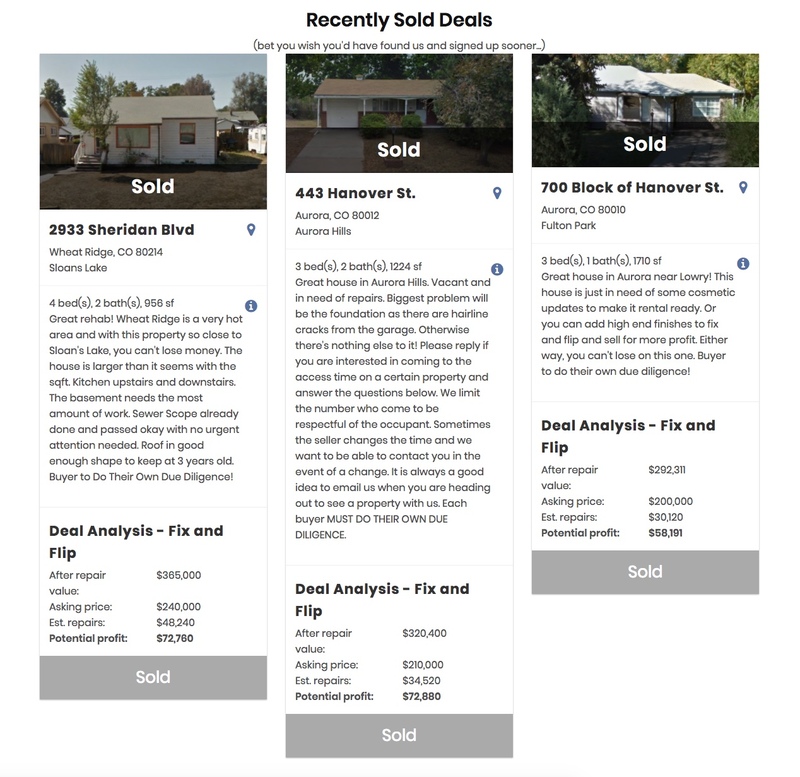 Right after their opt-in form, a visitor to their website will see 3 houses that got successfully sold. More importantly, these wholesaling breakdowns show the features of the houses, and what their price breakdown is. By showing the potential profit that an investor can make off of these properties, Wholesale Deals in Colorado is making their business a proven success. The key to wholesaling houses is letting the investors you sell to feel reassured that your properties will be profitable. Listing the details of your houses, and a breakdown of the success of your wholesale deals, is the number one reason to have a wholesaling houses website. We talked about how important having an opt-in form is in our article 17 Quickest Ways to Find Cash Buyers for Wholesale Deals, check it out if you missed it! We’ll still go over the importance of an opt-in form when it comes to wholesaling houses. 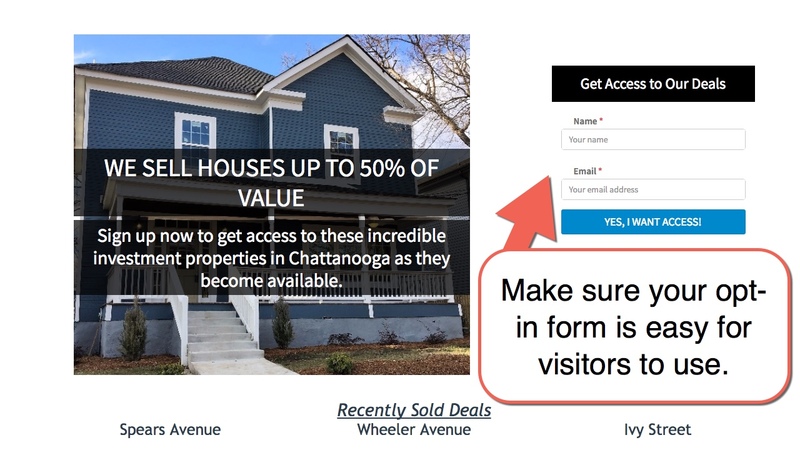 Having an easy to use opt-in form on your wholesaling houses website is a simple way to get visitors to leave their information with you. As a wholesaler, getting other investors’ information is key to building a strong cash buyers list. With a wholesaling website from LeadPropeller, we have built in opt-in forms as the first thing a visitor sees when they go to your website. The best part is how easy it is for visitors to leave their information with you. There are only 2 questions on the opt-in form. Your LeadPropeller site will ask for their name and their email. That way you have them added to your wholesaling houses email marketing list. Once they’re in your email list, you can send them specific properties so you can push your inventory. How often do you see push notifications while you’re on a website? The chances are, you see them a lot. That’s no surprise! Localytics found that push notifications boost engagement in website and app visitors by 88%. That’s insane! 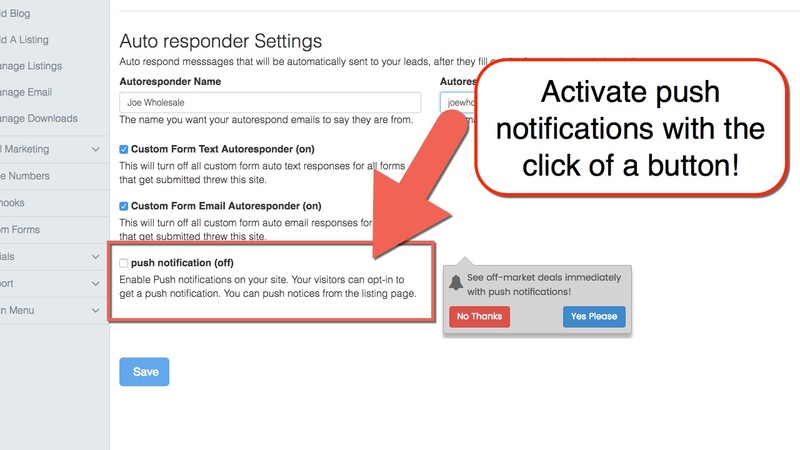 That’s why your wholesaling houses website from LeadPropeller has a push notification feature for your visitors. This is a LeadPropeller innovation that allows you to skip the clutter of everybody’s email inbox. Traditional websites only allow you to build an email buyers list and email the cash buyers when you have a new deal. LeadPropeller allows you to request permission to send cash buyers push notifications on their desktop when you have a new deal. Grab their attention instead of getting lost and buried in an inbox. Once you have your wholesaling website published, setting up your push notification is simple. Click on your website’s tab on the left hand drop down menu. Go all the way down until you see the “Push Notification” option. Now you’ll be able to send push notifications to your site visitors to show them the properties on your listing page! What a great way to push your inventory. Who has the most cash buyers? The people selling the most wholesale deals. We talked about this briefly with the example from our friends at Wholesale Deals Colorado. Because they’re showcasing all of their successful properties, and the price breakdown of all of them, they’re showing every one of their visitors that they’re high quality real estate investors. A wholesale website allows you to show the properties you’ve sold. It’s awesome to scroll through and see all of the deals you’ve done. There is a section on our wholesale website templates that allows you to showcase current and past deals. This entices true cash buyers to want to join your list and pot-in to push notifications because they will know you’re the real deal. Think about it this way: would you hire a photographer without looking at their work first? No. So why would you buy a house from someone without looking at their previous work? Show visitors to your wholesaling houses website that you’re a serious investor by showcasing your properties. There are tons of “make a website for free” websites, but the problem with those is all of the time you have to waste building your website. That, and, most of these free blank websites make you pay extra for features that any successful website needs. Take something like Wix for example. You can do a free site there, but you won’t be able to have a personalized domain name, you’ll have Wix ads placed on your site, and you won’t have access to your page analytics. Those are all common features on most “free website” template sites that are only available for a premium fee. Not cool. 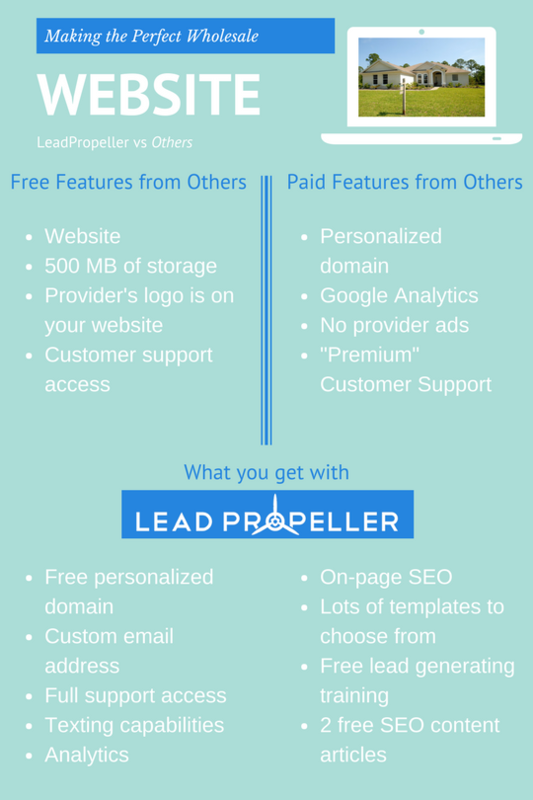 With LeadPropeller, not only do you not have to waste your time on building your own site, but we include all of the important perks at no extra cost. Need analytics? No problem. Need a custom domain? You got it. Need content on your site? We’ve got that too! In fact, all of our websites come completely built for you, complete with pictures and on-page SEO. When you enter in your business’s information, your LeadPropeller website will add it on all of your pages to make your website personalized to you. In addition to that, LeadPropeller websites boost SEO with our content packs. We won’t talk about them for too long here, but the short end of it is this: when you get a LeadPropeller website you’ll also get 2 content pack articles free of charge. These articles are great for SEO and will help to get your website ranked in Google fast! 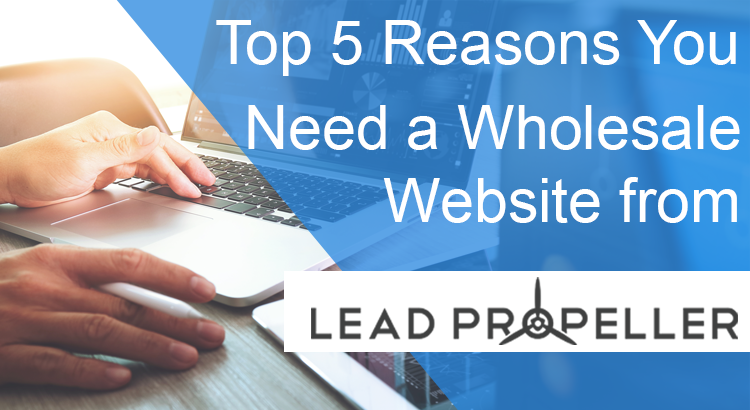 There’s no need to spend all of your time making an optimizing a website because LeadPropeller has you covered. 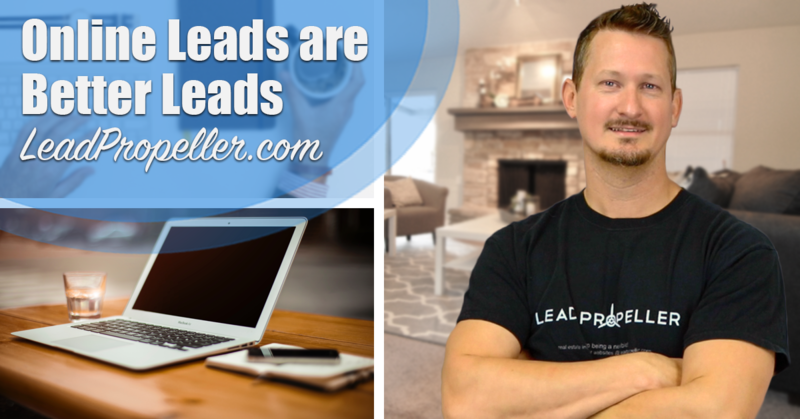 Growing your wholesaling buyers list has never been easier with a LeadPropeller website. Our on-page SEO will help you rank fast for local searches and drive more real estate investors to you. And with our opt-in forms, leaving their information with you is a breeze. Want to boost your Craigslist marketing? Download a free Craigslist posting template by clicking the button below!